Islamophobia has become a real danger to the foundations of democratic order and the values of the European Union. It has also become the main challenge to the social peace and coexistence of different cultures, religions and ethnicities in Europe. 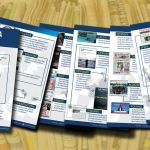 The country reports of EIR 2016, which cover almost all the European continent from Russia to Portugal and from Greece to Latvia, clearly show that the level of Islamophobia in fields such as education, employment, media, politics, the justice system and the Internet is on the rise. Since the publication of the last report there is little improvement. On the contrary, one can see from the country reports that the state of democracy and human rights in Europe is deteriorating. Islamophobia has become more real especially in the everyday lives of Muslims in Europe. It has surpassed the stage of being a rhetorical animosity and has become a physical animosity that Muslims feel in everyday life be it at school, the workplace, the mosque, transportation or simply on the street. The refugee movement and the turmoil it has created in Europe, the unprecedented rise of far right parties all across the continent and the UK’s Brexit decision, which took many by surprise, have revealed the importance and relevance of this report, which covers incidents and developments in 2016. The short-term political significance of Islamophobia is as much relevant as Islamophobia’s structural dimension. As mentioned before, small successes can be witnessed in some European countries yet great challenges lie ahead for deepening the values of human rights and freedom of religion in Europe. As a survey conducted by the Chatham House Europe Programme shows, public opposition to any further migration from predominantly Muslim states is by no means confined to Trump’s administration (implementation of the ‘Muslim-Ban’). Respondents in Austria, Belgium, France, Germany, Greece, Hungary, Italy, Poland, Spain and the UK were presented with the statement ‘All further migration from mainly Muslim countries should be stopped’. As the report reveals, the majorities in all but two of the ten states agreed to this statement, ranging from 71% in Poland, 65% in Austria, 53% in Germany and 51% in Italy to 47% in the United Kingdom and 41% in Spain. 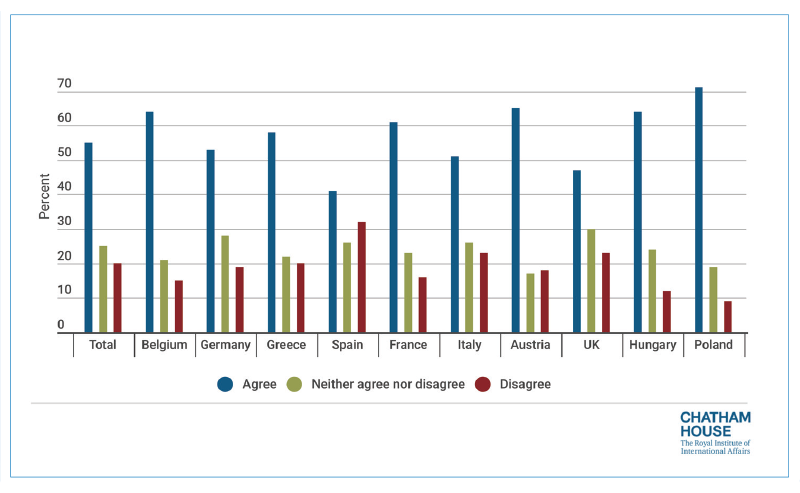 In no country did the percentage that disagreed surpass 32%. The findings of this report go hand in hand with similar surveys on this topic. The Ipsos Perils of Perception Survey 2016 found that the current and the future Muslim population in Europe are enormously overestimated in most countries. Out of the list of all 20 countries where respondents overestimated the Muslim population by more than 10 per cent, 12 are European, while the USA and Canada are among the remaining 8 countries. When asked “Now thinking about 2020, out of every 100 people, about how many do you think will be Muslim?”, the top 20 countries where proponents overestimated the Muslim population again were in majority European (11). The average guess in France is that 40% of the population will be Muslim in 2020 when the actual projection is 8.3%. Italy comes third with 26% overestimation, and Belgium and Germany fourth with 24% overestimation. These numbers are not shocking if we look at the incidents of Islamophobia and its pervasiveness in power structure across Europe. Muslims are seen as the enemy ‘within’. There is wide consent in Western societies to Muslims not being seen as equal citizens. Othering and differential treatment may also overlap with the dehumanization of Muslims. Thus, physical attacks and political restrictions can often be carried out and even defended in an atmosphere of wide distrust and enmity. Islamophobia is by no means confined to the working poor or the middle class, who have been misinformed about Islam and Muslims. It is especially true for the so-called educated elite. Discriminating policies like the ban of the hijab for certain professions, the ban of the niqab in public, bans of minarets and other laws restricting Muslim’s freedom of religion speak volumes. If politicians can take such decisions and the media, along with large parts of society, accept them, why should we wonder about the strong opposition to immigration of Muslim people in Europe? Hence, these numbers reveal the necessity of the EIR, which looks at the challenge of Islamophobia from a qualitative and not a quantitative research perspective. Its aim is to document and analyse trends in the spread of Islamophobia in various European nation states. There cannot be a claim of full comprehensiveness, since European nation states by majority still lack data collection. Hence, a central recommendation of the EIR is that Islamophobia or anti-Muslim hate crime should be included as a category in European nation states’ statistics – a development that has not occurred as of yet. The EIR’s primary contribution is to reveal the tendencies of Islamophobia and to give representative examples of its overall unfolding in the investigated states. “When talking about Islamophobia, we mean anti-Muslim racism. As Anti-Semitism Studies has shown, the etymological components of a word do not necessarily point to its complete meaning, nor how it is used. Such is also the case with Islamophobia Studies. Islamophobia has become a well-known term used in academia as much as in the public sphere. Criticism of Muslims or of the Islamic religion is not necessarily Islamophobic. Islamophobia is about a dominant group of people aiming at seizing, stabilising and widening their power by means of defining a scapegoat – real or invented – and excluding this scapegoat from the resources/rights/definition of a constructed ‘we’. Islamophobia operates by constructing a static ‘Muslim’ identity, which is attributed in negative terms and generalised for all Muslims. At the same time, Islamophobic images are fluid and vary in different contexts, because Islamophobia tells us more about the Islamophobe than it tells us about the Muslims/Islam”. We think that with this definition, we clearly address many of the suspicions, which are put against the term as such. As a matter of fact, while supranational institutions such as the OSCE embrace the terminology Anti-Semitism, the OSCE still refuses to use Islamophobia, which we see as part of the problem. Again, we recommend that Islamophobia/anti-Muslim Racism or anti-Muslim hate crime should be included in the collection of “equality data” in all European states. Institutions such as the OSCE need to establish solid monitoring and recording mechanisms for discrimination, hate crime and hate speech towards Muslims. In order to have reliable data, it has to be segregated by bias/category and also segregated by gender. This is even more problematic in countries that do not allow collection of data on religion or race. This seemingly egalitarian approach in reality hides the discrimination of Muslims. Also, response mechanisms seem to be unclear and not adequately used. When there is an incident of discrimination/hate crime/hate speech, there are different response mechanisms available, yet, none of these are familiar to the vast majority of Muslim citizens of European countries. Thus, we recommend that response mechanisms should be made more available, accessible and clear. Last but not least, an empowerment of the Muslim community is needed to strengthen critical citizenship and help European states deepen their democracies. The authors of every respective national report have suggested specific recommendations regarding the country they have covered. The following list of recommendations serves to underscore some of these recommendations and to add some additional suggestions on the supranational level. We think it is important for civil society to understand that Islamophobia is a problem of institutional racism. The illusion that Europe is a post-racial society prevents large parts of European societies from recognising the severe challenge of Islamophobia to local societies. The focus has to shift from from Muslims‘ actions to those of European societies.. Racism, including Islamophobia, tells us more about the racists than about the their imagined scapegoat or their victims. Hence, Islamophobia reveals aspects of Europe and the internal problems European societies continue to face. A recognition and a critical consciousness of this societal disease is of utmost importance to be able to create more just societies in Europe. At the same time, Muslims must be allowed to enjoy their spaces of freedom like other dominant religious and political groups in European societies without being securitised or criminalised. The securitisation of Islam, especially policies countering violent extremism and their impact on the freedom of religion of belief for Muslims, and even freedom of movement or free assembly have to be challenged by all democratic forces in Europe. Communities must be consulted and human rights frameworks must be respected. National security is not among the criteria that should permit the limitation of freedom of religion or belief. We especially urge politicians to speak out against Islamophobia as one of the most pressing forms of racism in our days. Europe needs more courageous politicians who do not only challenge the politics of right-wing populist parties, but also challenge institutionalised forms of racism targeting Muslims in the fields of employment, education, state bureaucracy, and media. We also call for journalists and editors to challenge Islamophobic reporting in their news media and give space to more balanced views. Generally, the issue of religious literacy is a huge problem that does not only concern media but also the police, prosecutors and civil servants. We see that people simply lack basic knowledge on Islam and Muslims’ practices. We see a need for the introduction of more comparative religion courses, or religious teaching, in a formal and informal educational setting. We see that Muslim women are among the most vulnerable direct victims of Islamophobia. ENAR has conducted a report on the impact of Islamophobia on Muslim women and presented 37 recommendations, which we can only underscore given the findings of our report. Women who are visibly Muslim are socially are socially ostrasised in many places. The combination of internal community problems, discrimination (education and employment) and hate crimes against Muslim women (data shows that it is 70% more likely for a muslim woman to be attacked in the street) are leaving their horrible mark on Muslim women. Hence, the protection and the empowerment of Muslim women have to be on the central agenda of states and NGOs. The ruling of the European Court of Justice regarding Esma Bougnaoui’s dismissal by a French company for wearing a hijab when dealing with clients as unlawful discrimination is an important step towards equality and an anti-discriminatory society. At the same time, the case of Belgian Samira Achbita vs. Belgium, where it was argued that a dismissal due to the headscarf would be permissible against the backdrop of a general prohibition of all outward signs of political, philosophical and religious beliefs exhibited by employees in the workplace, is worrying and challenges the reality of a diverse Europe. 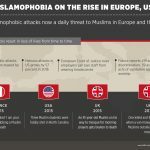 To cite this Text: Enes Bayraklı & Farid Hafez (2017): The State of Islamophobia in Europe in 2016 in: Enes Bayraklı & Farid Hafez, European Islamophobia Report 2016, Istanbul, SETA, 2017, pp. 5-11. Enes Bayraklı & Farid Hafez, European Islamophobia Report 2015, Istanbul, SETA, 2016, p.7.